Seeming to appear out of nowhere about 10 years ago, brothers Enzo and Carlo Revello took over their father's nine-hectare estate and almost immediately became one of the hottest estates in La Morra. The brothers are also very close to Elio Altare, who, along with Beppe Caviola, has worked with them since their decision to leave their previous careers for full-time winemaking work. 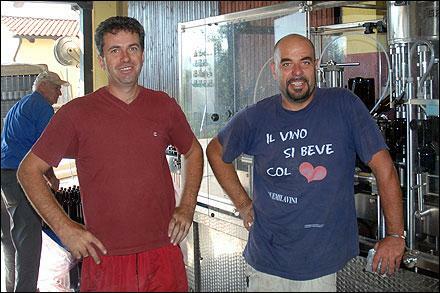 Enzo works mainly in the cellar and Carlo in the vineyard. Since the release of their first Barolo (1993 vintage), which was a blend of fruit from all of their vineyard holdings, the brothers have released four cru bottlings, "Giachini", "Rocche dell'Annunziata", rare "Conca" and the "Gattera," first released in 1999. James Suckling 92 "This is more like a Barolo with its rich, deep fruit and soft tannins. Full-bodied, fresh and flavorful. Excellent. Drink now" Wine Information: 100% Nebbiolo planted in calcareous clay soils at 230-250m above sea level. Fermentation and maceration with the skins for approx.